San Diego State failed to receive a berth in the NCAA men's basketball tournament Sunday, ending its six-season streak. 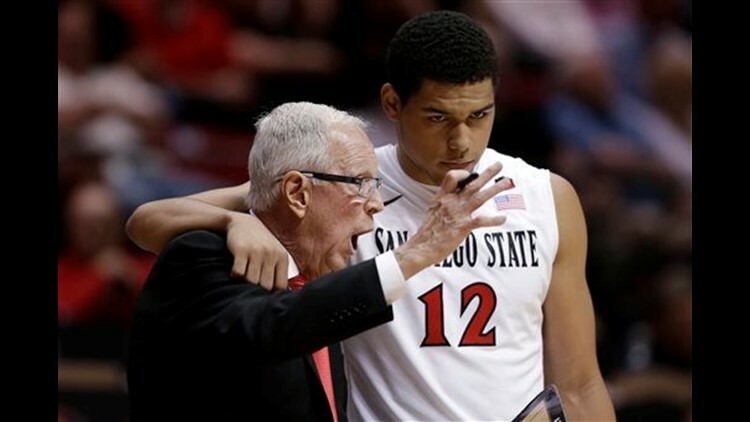 SAN DIEGO (CNS) - San Diego State failed to receive a berth in the NCAA men's basketball tournament, ending its six-season streak. Instead, the Aztecs (25-9) will play in the National Invitation Tournament for the first time since 2009, playing host to Indiana-Purdue-Fort Wayne (24-9) Tuesday in a first-round game. San Diego State missed a chance to assure itself of an NCAA tournament berth when it lost to Fresno State, 68-63, in the championship game of the Mountain West Conference tournament Saturday in Las Vegas. The Aztecs were the Mountain West Conference regular-season champion. The Mastodons shared the Summit League regular-season title with South Dakota State, which won the conference tournament. Regular-season conference champions that fail to receive NCAA tournament berths receive NIT berths. San Diego State has made five previous appearances in the NIT, including reaching the quarterfinals in 2009.